SAVEUSE DE BEAUJEU, JACQUES-PHILIPPE, office holder, seigneur, militia officer, and politician; baptized 5 May 1772 on Île aux Grues, Que., son of Louis Liénard* de Beaujeu de Villemonde and Geneviève Le Moyne de Longueuil; d. 19 June 1832 in Montreal and was buried in the church of Soulanges (Les Cèdres), Lower Canada. Jacques-Philippe Saveuse de Beaujeu belonged to a noble family that had a long military tradition. His grandfather, Louis Liénard* de Beaujeu, as well as his father and his uncle Daniel-Hyacinthe-Marie Liénard* de Beaujeu had chosen military careers, in which they had distinguished themselves. 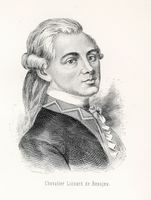 Jacques-Philippe broke with the family tradition and in 1794 assumed the office of Protonotary of the Court of King’s Bench for the district of Montreal. On 3 Nov. 1802 at Vaudreuil, Saveuse de Beaujeu married Catherine, daughter of Gaspard-Joseph Chaussegros* de Léry. Through this marriage he extended his connections with official circles. The bride’s cousin, Michel-Eustache-Gaspard-Alain Chartier de Lotbinière, the widow of Michel Chartier* de Lotbinière, Louise-Madeleine Chaussegros de Léry, and the groom’s uncle, Joseph-Dominique-Emmanuel Le Moyne* de Longueuil, had been present at the signing of the marriage contract the previous day. Saveuse de Beaujeu signed the document in a beautiful hand, as was the fashion of the period, using only his surname and the family’s territorial designation. He put 24,000 livres into the community of property; his wife brought a dowry consisting essentially of rights to her parents’ estate. The jointure, a sizeable one for the period, was set at 10,000 livres. On 12 June of that year Saveuse de Beaujeu renounced his father’s estate, which was too encumbered with debt. In 1807, however, he came into a large inheritance from his maternal uncle, Joseph-Dominique-Emmanuel Le Moyne de Longueuil, who had died without an immediate heir. The estate was a considerable one: a manor-house, the seigneuries of Soulanges and Nouvelle-Longueuil, mills, 160 arpents in the barony of Longueuil, part of Newton Township, moneys owing in excess of 23,600 livres, and assets in cash estimated at £245. His sole obligation in return for this inheritance was to guarantee his two sisters, Élisabeth-Geneviève and Adèle, one-fifth of the income from the seigneuries for the rest of their lives. Saveuse de Beaujeu, who was a captain in Montreal’s 2nd Militia Battalion, served during the War of 1812. In 1813 he resigned from his office as protonotary. He was elected to the House of Assembly of Lower Canada for Montreal East in 1814, but he did little more than pass through the assembly, since he left it in February 1816. In 1823, at the height of the Canadian party’s struggle with the administration over supplies, he refused an appointment to the Legislative Council. In 1828, through an attorney, Saveuse de Beaujeu sought a delay in rendering fealty and homage, a duty required of him as a seigneur. He was in Europe at the time, probably staying with his brother, Charles-François. On his return to Lower Canada the following year he went to Quebec in order to renew his oath of fealty and give the particulars of his property titles. 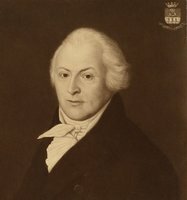 Saveuse de Beaujeu agreed in April 1830, despite protests from the Canadian party, to join the Legislative Council, on which his brother-in-law, Louis-René Chaussegros de Léry, already sat. On 1 October of the following year he drew up his will, making his wife heir to his personal estate, his cash and moneys owing him. He bequeathed his real estate and seigneurial income to his son Georges-René*; to his daughter Catherine-Charlotte he left a secured annuity of £360. In 1832 Saveuse de Beaujeu succumbed to the cholera that was then raging in Lower Canada. ANQ-M, CE1-50, 3 nov. 1802; CE1-51, 19 juin 1832; CN1-74, 12 juin 1802, 21 nov. 1806; CN1-117, 2 nov. 1802. F.-J. Audet, Les députés de Montréal. Langelier, Liste des terrains concédés, 1073. Le Jeune, Dictionnaire. Officers of British forces in Canada (Irving), 167. Turcotte, Le Conseil législatif. [François Daniel], Histoire des grandes familles françaises du Canada ou aperçu sur le chevalier Benoist et quelques familles contemporaines (Montréal, 1867). Alphonse Gauthier, “Études généalogiques: la famille de Georges-René Saveuse de Beaujeu (1810–1865),” SGCF Mémoires, 6 (1954–55): 197–208. Jean-Jacques Lefebvre, “SAVEUSE DE BEAUJEU, JACQUES-PHILIPPE,” in Dictionary of Canadian Biography, vol. 6, University of Toronto/Université Laval, 2003–, accessed April 26, 2019, http://www.biographi.ca/en/bio/saveuse_de_beaujeu_jacques_philippe_6E.html.